On March 15, 1717, King James III and VIII left Modena. He crossed the Panaro River and entered into the territory of the Papal States for the first time. Here he was welcomed by Prince Carlo Albani, nephew of Pope Clement XI. 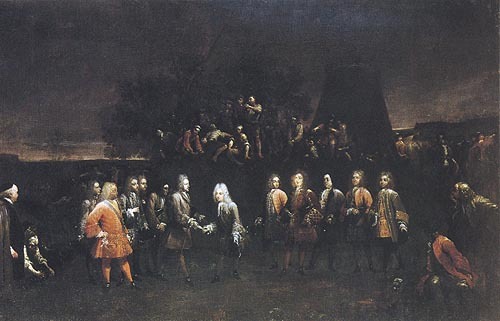 At the center of the painting can be seen James III and VIII taking a letter from Prince Carlo Albani who bows in reverence. Behind Prince Albani are five Bolognese nobles: Marchese Bufalini, Grassi, Giorgio Marsili, Francesco Zambeccari, and Ercole Aldrovandi. Behind James are various members of his court; the man in red wearing the sash of the Most Noble Order of the Garter is probably James Butler, 2nd Duke of Ormonde. The painting may have been a companion piece to a painting by Antonio Gionimo, The Reception of King James III and VIII by Cardinal Ulises Giuseppe Gozzadini at the Archiepiscopal Palace in Imola, now in Castel Sant' Angelo in Rome. The Národní Gallery has several locations. I have not been able to determine at which of these Crespi's painting is on display, but it is most likely in the Sternberg Palace. 1 Giampietro Zanotti, Storia dell'Accademia Clementina di Bologna (Bologan, 1739), II, 60. The oil on canvas painting measures 146 cm high and 223.5 cm wide. Crespi was born at Bologna in 1665 and died in the same city in 1747. 2 In 1922 the painting was in the collection of Aldo Briganti in Rome. In 1941 it was sold to the Narodni Gallery by the Böhler Gallery in Munich; cf. Mira Pajes Merriman, Giuseppe Maria Crespi (Milan: Rizzoli, 1980), 288. Image 1 (The Meeting of King James III and VIII and Prince Albani): Andrea Emiliani and August B. Rave, Giuseppe Maria Crespi, 1665-1747 (Bologna: Nuova Alfa, 1990), 118.